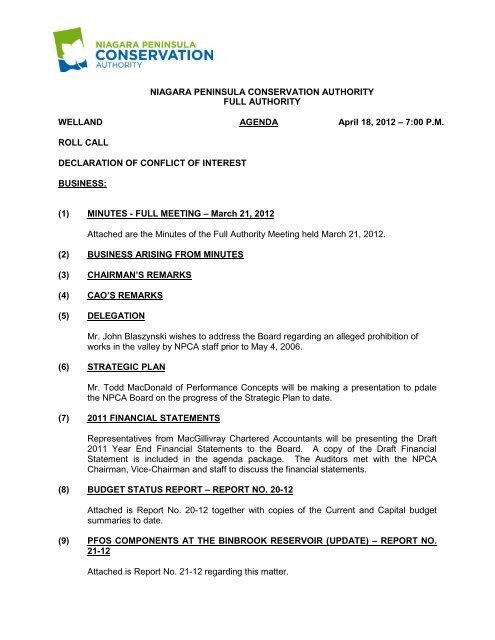 NIAGARA PENINSULA CONSERVATION AUTHORITYFULL AUTHORITYWELLAND AGENDA April 18, 2012 – 7:00 P.M.ROLL CALLDECLARATION OF CONFLICT OF INTERESTBUSINESS:(1) MINUTES - FULL MEETING – March 21, 2012Attached are the Minutes of the Full Authority Meeting held March 21, 2012. (2) BUSINESS ARISING FROM MINUTES(3) CHAIRMAN’S REMARKS(4) CAO’S REMARKS(5) DELEGATIONMr. John Blaszynski wishes to address the Board regarding an alleged prohibition ofworks in the valley by NPCA staff prior to May 4, 2006. (6) STRATEGIC PLANMr. Todd MacDonald of Performance Concepts will be making a presentation to pdatethe NPCA Board on the progress of the Strategic Plan to date. (7) 2011 FINANCIAL STATEMENTSRepresentatives from MacGillivray Chartered Accountants will be presenting the Draft2011 Year End Financial Statements to the Board. A copy of the Draft FinancialStatement is included in the agenda package. The Auditors met with the NPCAChairman, Vice-Chairman and staff to discuss the financial statements.  (8) BUDGET STATUS REPORT – REPORT NO. 20-12Attached is Report No. 20-12 together with copies of the Current and Capital budgetsummaries to date. (9) PFOS COMPONENTS AT THE BINBROOK RESERVOIR (UPDATE) – REPORT NO.21-12Attached is Report No. 21-12 regarding this matter.